Side dishes are kind of an after thought around here...I tend to focus more on the main dish and then throw some greens on the side because Im just hungry and want to put food in my mouth asap! However, today I thought I would dedicate a bit more thought on a side dish that is extremely simple to put together and can easily be adapted. I used canned chickpeas, shelled edamame, (don't you love those crunchy little green gems?) mint and lemon juice. How easy is that? I actually liked this couscous better cold, right out of the fridge. Mmm, boy was it good. The mint and tiny lemony couscous balls are so light and fluffy they dance on your tongue. This one is definitely being added to the rotation. What's your go-to side dish? 1 Prepare couscous according to package directions. Pour into large bowl. 2 In a separate bowl, combine juice of one lemon with the chickpeas and mix together. 3 Mix the lemony chickpeas with couscous, then add the edamame. 4 Slice some mint leaves up and throw into couscous mixture and combine. 5 Juice second lemon on top of the whole salad and combine throughout. 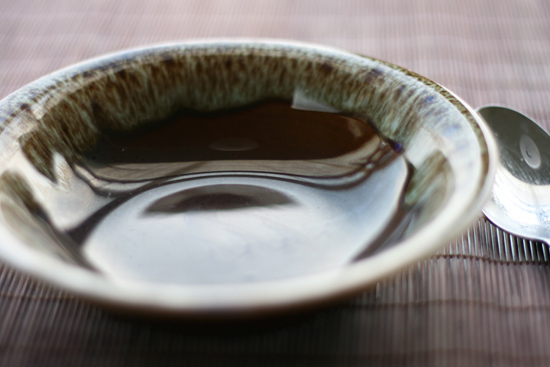 I bought a set of these rich brown lacquer bowls yesterday seen in the picture above. Here is a somewhat better shot of the colored edge of the bowls. giving me such a sweet award! 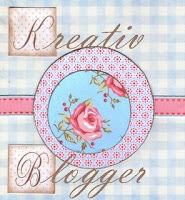 Go and check out her lovely blog! Oh, and don't forget to submit for BSI: Feta. Deadline is Sunday, July 12. Oh,lemon and mint with couscous? Sounds absolutely lovely, and perfect for summer! YUM! Thanks for choosing feta! It's one of my fav cheeses! I have never had couscous...this sounds delicious, guess I've been missing out! I will have to give it a try!! Sounds and looks simply wonderful! How do you think it would be with basil in place of the mint? I have a ton of basil in my garden. oh, that sounds SO good!!! That couscous looks good! I love your pretty bowl! 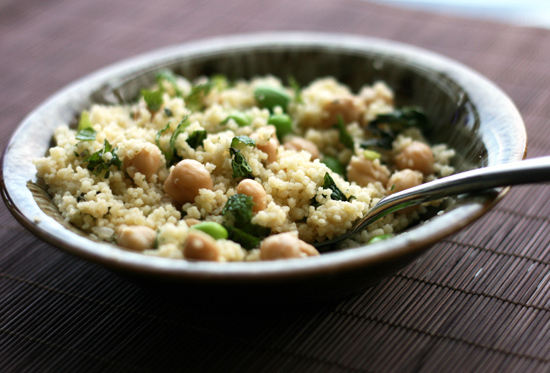 I love chickpeas although couscous is not a regular in our home.Will be trying this out. I adore chickpeas, what a fantastic way to use them. Sounds-- and looks-- fantastic! The Ungourmet- I think basil will be fine. I was also deciding whether to use mint or basil. what a totally awesome side dish! i adore both chickpeas (which i almost always have in hummus-form) and edamame, and a little citrusy couscous is always welcome. good stuff! That looks like it could be a meal on its own! Great idea of combining edamame and chickpeas. THis is the perfect couscous for sure! I know the lemon and mint makes it divine (as it does in taboulli), and those chickpeas are perfect! Love your egg salad, too--thanks!!! Oh, I absolutely LOVE the bowls! And couscous or rice is usually my go-to side dish...so many possibilities :) ps...don't think I'm going to catch up in time to enter BSI this week :( ...but I do luv Feta! What an amazing picture! The flavors sound so fresh and appealing, also. I have a dinnerware addiction. Love your bowls. And the couscous looks great, nice combination of ingredients! I look forward to trying this, especially since those are items I always have on hand. See, I'm a side-dish lover! Seriously, I often forgo the main altogether and just feast on sides! That's why I love finding new ideas, like this lovely salad, which I know I'll love! I'm the same way with side dishes and often make couscous because it cooks so quickly. I love the edamame and chickpeas in yours - yum! What a great recipe. It is SO me, I might have to make it for lunch tomorrow. I am totally making this!! Love it.